easy and simple way of implementing Sitecore User Profile Custom Properties. Here we are storing Full Name in custom properties with the Property Name “Full Name”. Let us first do Sitecore Configurations. 1) We’ll first start with the properties that we want to store. Go to Core database. We have to define a new template item and add all the property names that you want to store. We are storing Full Name. Here we have created a new folder Users and added a new template Custom Profile derived from Template. You can create a new template anywhere under the templates section. Add a new Item with the Template that you newly created. Our Sitecore Configurations are done! J But we haven’t finished yet. and update the Profile ID of the user Otherwise we won’t be able to see the Custom Property Values in Sitecore. It is must to Save the Profile else value won’t be saved. 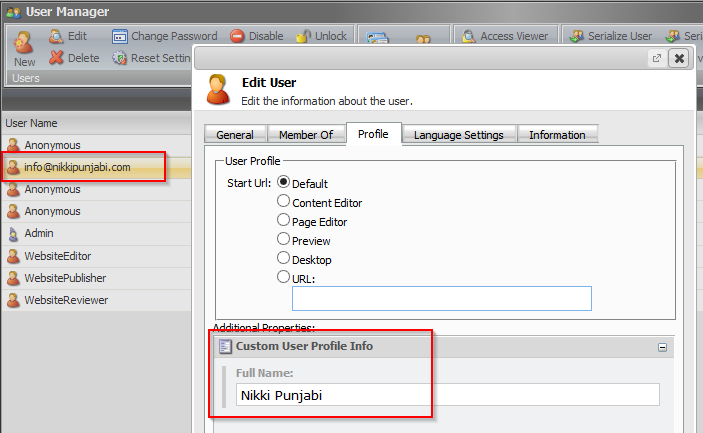 Now this will create a new user and will have “Nikki Punjabi” as a value of Custom Property – “Full Name”. Now let’s look at how to fetch Custom Property of a user. You can also see the Custom Property Values for a user in Sitecore. If you know any other better approach or have any good idea then do give a shout by contacting me.